(BMG) CD (15 tracks) plus 2 DVD (25 tracks) NTSC, Code 0, Color, complete show with 25 solo and duet recordings, hosted by Reba McEntire plus bonus interviews and two music videos (50.000 Names & The Cold Hard Truth). Captured in HI-Definition at the Roy Acuff Theatre in Nashville,TN and mixed in 5.1 Surround Sound. Stunning! Deluxe CD/DVD edition. A live tribute to George Jones' 50th year as a recording artist. 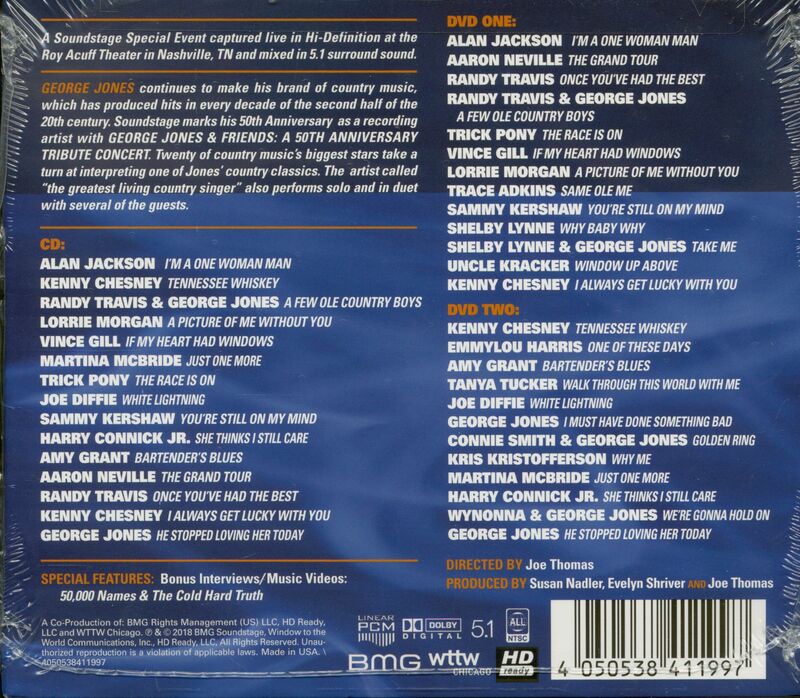 The stellar cast of guests included Vince Gill, Harry Connick Jr., Aaron Neville, Amy Grant, Sammy Kershaw, Randy Travis, Trace Adkins, Kris Kristofferson, Emmylou Harris, Alan Jackson, Martina McBride, Wynonna, Shelby Lynne, Joe Diffie, Trick Pony, Lorrie Morgan, and Kenny Chesney. Record Labels: Starday, Mercury, Longhorn, Power Pak, Hillside, United Artists, Musicor, RCA, Intercord, Ace, Rounder, Epic. In November, 1953, he was fresh out of the Marines, having joined two years earlier in the wake of an unraveling marriage. Before taking the oath, he'd been a denizen of honky tonk stages in and around Beaumont, Texas. Born in a rough-cut log house near Saratoga in East Texas' mysterious, often violent Big Thicket region on September 12, 1931, hillbilly music surrounded him as a kid; his singing voice turned heads even when he was an adolescent. Jones wasn't back long when he heard about Starday, a new record company. Lefty Frizzell's ex-manager Jack Starnes and hard-bitten Houston area railroader-turned-juke box and slot machine impresario-turned record label owner, distributor and retailer Harold 'Pappy' Daily co-founded it in 1952. 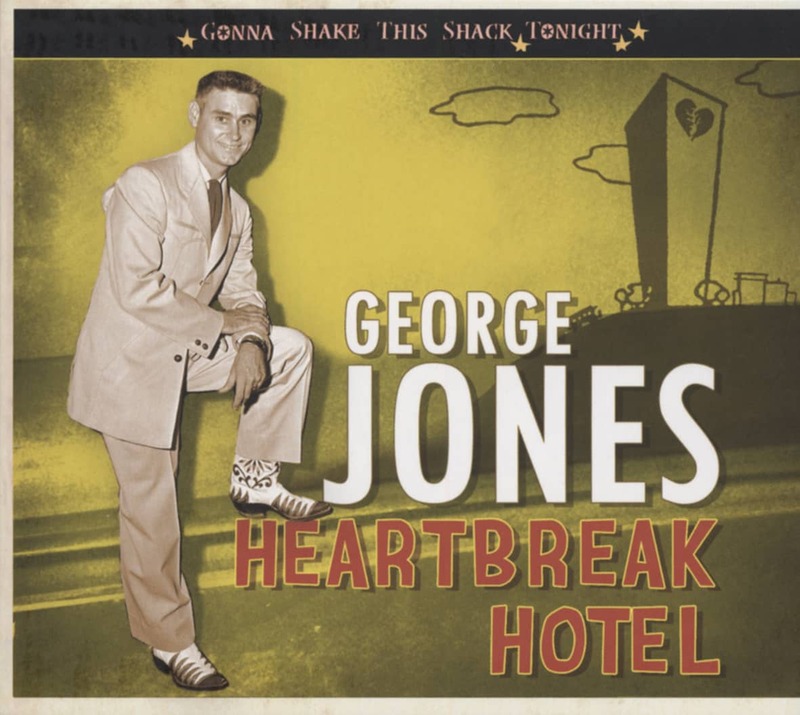 George's buddy, aspiring local singer Sonny Burns, had dealings with them, so Jones returned to playing the dives around the area, expanding his profile in 1954 as a disc jockey over KTRM. He soon found Starday interested in auditioning him. His audition and first session took place in Jack Starnes' living room-turned-improvised recording studio. 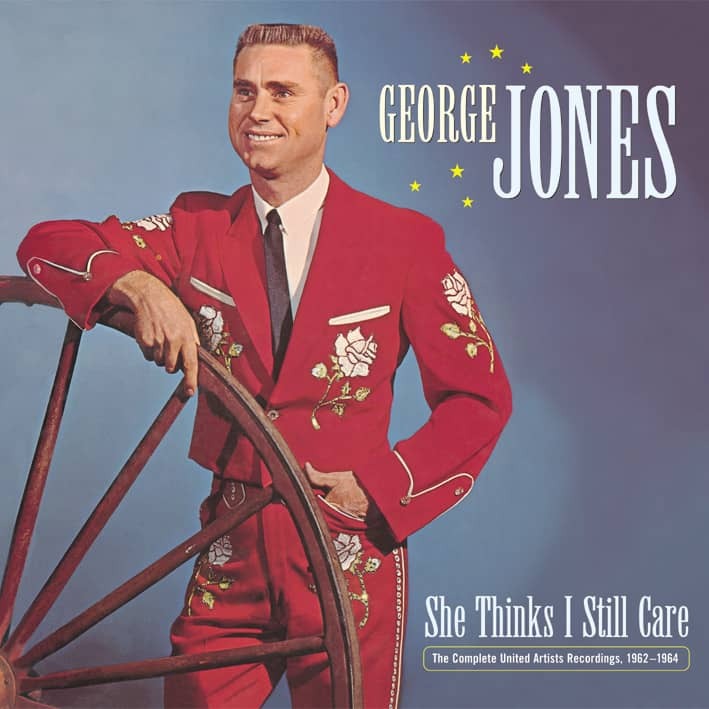 With an amateur's passion for the era's great singers, he tried to emulate the best of all of them as he sang--until Daily asked with great sincerity, "George, you've sung like Roy Acuff, Lefty Frizzell, Hank Williams and Bill Monroe. 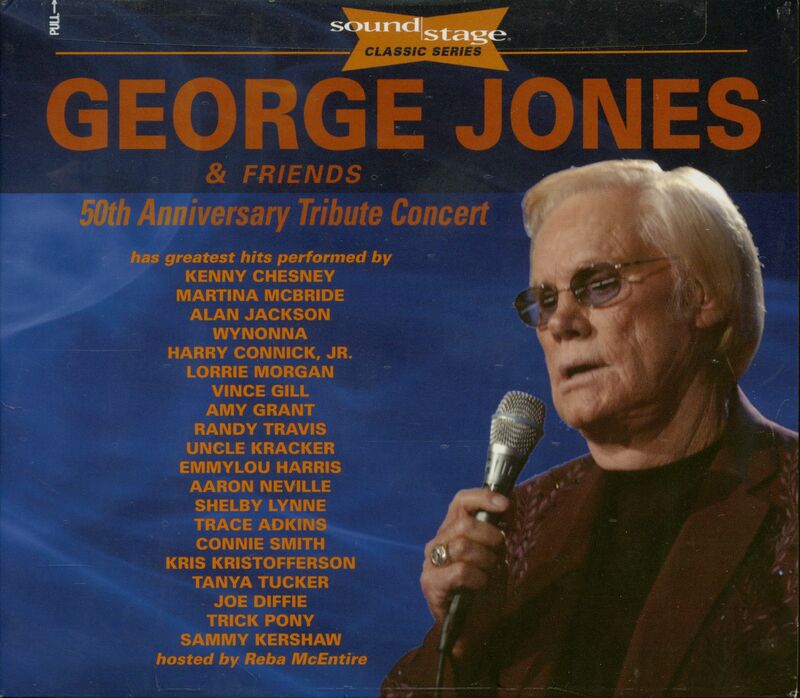 Can you sing like George Jones?" No Money In This Deal, the first single, came from that session. It didn't take. Neither did the next five singles. It was single number seven, the Hankish Why Baby Why that landed in the Top Ten in 1955. More Starday hits followed. After a brief, abortive alliance between Starday and Mercury Records, Daily, who still co-owned Starday with his partner Don Pierce, (Jack Starnes had departed earlier) fell out with Pierce in 1958. When the smoke cleared, Pierce took Starday; George wound up contracted to Pappy and remained a Mercury artist. Pappy kept his hand in the regional market. He'd formed Houston-based D and Dart Records as a regional operation aimed at finding new talent, Gabe Tucker helping him run things. Glad Music, Daily's new publishing company, would handle that end of things. 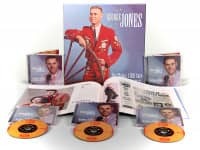 Jones came up with some landmark hits on Mercury, among them Color Of The Blues and the Chuck Berry-influenced White Lightning, from the pen of Daily discovery and Jones buddy, KTRM disc jockey-singer-composer J. P. 'The Big Bopper' Richardson. He originally recorded his hard-driving rocker Chantilly Lace for D, until Mercury, who'd initially passed on it, re-released it nationally. That put it over the top and made the Bopper and fulltime rock star from later '58 until February 3, 1959, when the small private plane carrying him, Buddy Holly and Ritchie Valens crashed killing everyone on board. At Mercury, Jones's vocal style began evolving, his keening, edgy nasality morphed into a more distinctive type of phrasing. Overtones of Hank and Acuff remained, but Jones's voice moved into a lower register. He could wrench emotion out of a phrase or lyric by bearing down on it as he sang. The new maturity manifested itself in his final Mercury hits: The Window Up Above and especially the #1 single Tender Years, where the formerly twangy accompaniment replaced by muted Nashville Sound backing. The new Jones style quickly began influencing others, Buck Owens among them. Interviewed in 1988, Buck confirmed that point. "I thought that George was the greatest thing since sliced bread. I could not help it and later on in the last years I've tried to make a concerted effort to not get into that, but if you listen on (my records in the) early years, you're sure gonna hear George because he was a big influence on me as far as the singers go," he said. As time passed, George began singing in lower registers that combined with his distinctive phrasing his singular sound brought more admiration among fans and his peers. Pappy came to know Mercury executive Art Talmadge, who'd left to join United Artists Records. Daily and Jones followed him there. The label was only four years old. Originally created to distribute soundtracks from UA-produced films, it branched out, becoming a hip jazz label and then broadened into other areas. Their newly-created country division consisted mainly of Daily acts with Jones as the flagship, Pappy serving as UA's de facto country producer. 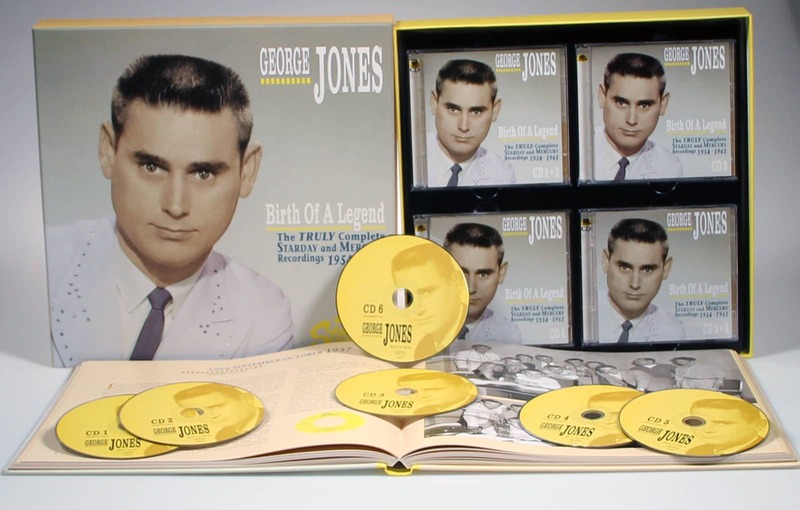 Jones's relationship with Daily was business only, and fostered deep resentment that hadn't abated in his 1996 autobiography 'I Lived To Tell It All,' where he wrote bitterly, "I made a lot of money for Pappy Daily, Starday and Mercury. Basically, I was a naïve guy who was overly trusting of some people who proved to be untrustworthy. I was never paid royalties on a regular basis. It became very frustrating to hear my songs on the radio, see them listed high on the charts and not have enough money to hire a band." His two-year UA contract yielded exactly 151 recordings. Some singles and albums from that period stand among his most memorable. Every album was 'produced by Pappy Daily.' Or so it seemed. 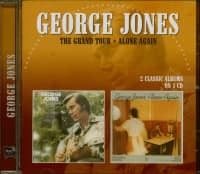 In 2001, Jones clarified their 16 year studio relationship, which continued through his 1965-1970 stint with Talmadge's Musicor Records. "A lot of people think (Pappy) was the producer, but he really wasn't. He timed the songs in the studio and he wrote out the paperwork. That was about all he did. I worked with the musicians myself and we worked out the arrangements. I basically left it up to the musicians after we run through the songs. I wanted them to be more a part of the production." Jones created many great moments in the studio during his UA phase. Some were captured on tape, some not. His legendary reputation as a drinker and hellraiser already established, his stature continued to rise. Many Nashville insiders began hanging at George's sessions, both to marvel at the voice and to see what whiskey-fueled mischief he'd make this time. One frequent sideman explained that while Jones was usually well-lubed throughout a recording session, a certain sweet spot existed. Too few drinks didn't loosen him up sufficiently; too many washed out a session. An amount of alcohol in between those extremes unleashed every bit of his unrestrained, uninhibited power. 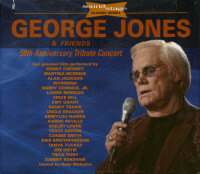 Customer evaluation for "George Jones & Friends - 50th Anniversary Tribute Concert (CD+2-DVD)"